Joe Smith said he will return from a sprained ankle on Wednesday to assist a taxed Angels bullpen. The set-up man for closer Huston Street, who is likely sidelined for the rest of the regular season, isn’t sure what his role will be. – First and foremost, the news on Huston Street was not great, but it could have been worse. He has a Grade 1 strain of his left groin sustained in Saturday’s game. He told reporters after Sunday’s game his return during the regular season is doubtful, but that he was going to try hard to be ready for the postseason should the Angels make it. The Angels enter play Monday still just a half-game out of the second wild-card spot. – Before this game, set-up man Joe Smith told this newspaper his ankle is feeling better. “It’s better, I’m walking,” he said. But Smith is not yet ready to return. If he can get back in the next couple of days, it’s likely he’ll be put into Street’s closer’s role. – David Freese hit another big home run, smacking No. 13 in the bottom of the fifth inning for a 2-1 Angels lead. Freese is hitting .329 with two home runs and 10 RBIs this month after missing 5 1/2 weeks with a fractured finger. – You have to love the tenacity of Johnny Giavotella. He singled to open the bottom of the eighth, but turned it into a double when centerfielder Brad Miller took his time getting the ball into the infield. Taylor Featherston ran for Giavotella and, after being sacrificed to second by Erick Aybar, he scored on an RBI single by Kole Calhoun. It was RBI No. 80 for Calhoun, who has established himself as one of the better overall right-fielders this season. Understandably, there was still a lot of talk Sunday morning about the spectacular catch Angels centerfielder Mike Trout made in the fourth inning of Saturday’s 3-2 victory over the Seattle Mariners. 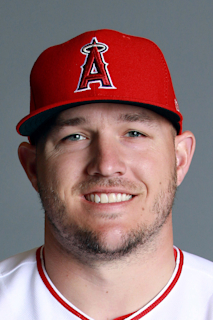 Trout’s catch – which saw him make like Spider Man, climbing the ball to where his waist was even with the top of it – robbed Jesus Montero of a 3-run home run. It was about three hours before Sunday’s series finale. Trout had all night to think about the catch that helped his team stay a half-game behind Houston for the second wild-card spot. Though he has made some terrific catches in the past, he had decided this was his best. “Yeah, I think so, for sure,” he said. Trout said that he and other outfielders practice home-run-robbing in batting practice, though he was quick to note they don’t necessarily climb the wall. It’s the best catch manager Mike Scioscia can remember seeing. Following the Angels’ 3-2 win over the Mariners, Steve Ramirez and rest of the press caught up with Mike Trout, David Freese and Mike Scioscia.